If you want an underdog story told in the most unorthodox way possible, look no further than Legally Blonde: The Musical. On its face the show is plastic nails and a shade of pink that makes Barbie look manly, but if you let it, the show can actually surprise you. There’s a lot of heart and a positive message about the power of diversity and the difficulties of being true to yourself when other people are saying something else. The overall vocal talent of Top Hat 8 Repertory’s cast cannot be denied, although multiple issues with the singing dynamics hamper the overall enjoyment of a truly spirited performance. The heroine of the story is Elle Woods. She is beautiful, wealthy, a Sorority president, and on the verge of graduating from UCLA with a GPA of 4.0. In the song “Serious” Warner explains how he only sees her as a superficial human being, and that he needs something different in order to achieve his ambitions as a Senator. Yes, he needs to have someone more like Jackie Kennedy, and less like Marilyn Monroe . So he dumps Elle. Instead of letting him go, Elle follows her heart and molds herself into the person she thinks Warner wants by getting into Harvard Law School. In the process, Elle discovers self-respect, learns to find value in who she is, and becomes a lawyer on her own terms. Legally Blonde is one of those stories packed full of morals wrapped in pretty pink paper to disguise the fact that you might actually be learning something. It also alerts the audience to a rarely considered idea–namely, that rich people have problems too. True Elle is not starving and her life isn’t in mortal danger, but she does experience quite a bit of discrimination because of who she is and how she appears. Legally Blonde’s response to other’s perceptions? Elle might just save the day. The musical direction from the live band was exceptional. The band plays an eclectic mix of musical styles during this production ranging from Reggae, Jazz, Pop and even a touch of Irish music. Live music is almost always a better choice when producing musicals, and this show isn’t the exception. Conversely, it also opens you up to inconsistent dynamics, and the band does drown out the singers quite a few times. These issues alternated between being the fault of microphones and trouble on behalf of the singers’ to project. Mic issues and sound projection with certain performers were certainly the biggest problems. The technical difficulties had no bearing on the acting. Lauren Anderson is phenomenal as Elle and leads the production with a strong voice and movement throughout the entire production. Although I’ve seen the movie and knew most of the plot going in, a good actor/actress can always bring something new to the story. The song, “Ireland” is one of those added treats that I never could have anticipated from watching the film. Paullete (Janina Brown) is a beautician who sings this song about her love of Ireland, and it is by far one of the best songs performed the entire night. Brown is a wonderful singer. Justin Budds (Emmett Forrest) is charming and laid back as Elle’s love interest, and manages to help bring a great couple to life. However, Budd’s needs to work on projecting his voice, especially in the song “Chip On My Shoulder” where it was often hard to hear him. He has the talent and it shows in the duet “Legally Blonde” at the end with Elle, they nail it. OMG! 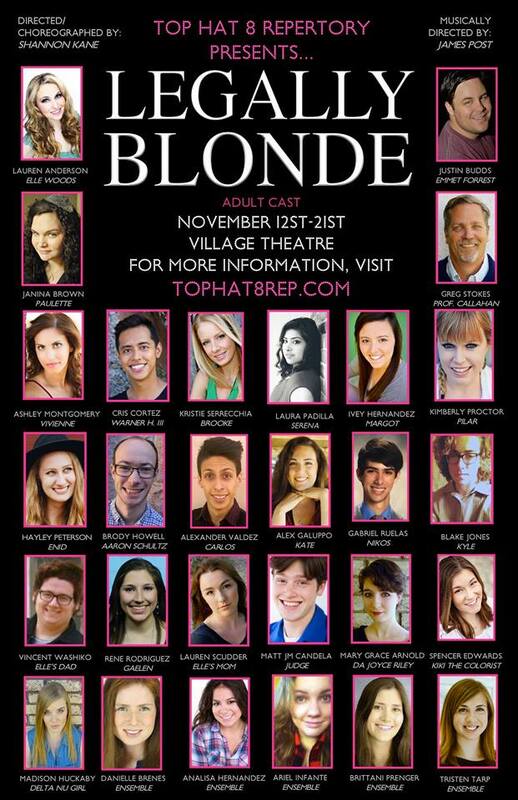 There is so much good in Top Hat 8 Repertory’s Production of Legally Blonde The Musical, and with some fine tuning, I couldn’t help but recommend this show. The musical direction from the live band was exceptional. Standout performances. Mic issues and sound projection with certain performers. Singing dynamics issues with the band and the singers. The overall vocal talent of Top Hat 8 Repertory's cast cannot be denied, although multiple issues with the singing dynamics hamper the overall enjoyment of a truly spirited performance.